Nadir shah defeated the Indian troops at Karnal on February 24, 1739 and sent his men along to capture Delhi. Haji Faulad Khan who was the kotwal of the city refused to let him in at first. But Lutfullah Khan, the governor, was compelled to open the gates when he saw the letter written by Mohammad Shah, in which he surrendered to the invader. So there was nothing to do but to hand over the keys of the fortress, the treasury and the store houses to Nadir Shah’s men. Nadir Shah entered the city triumphantly. The streets were lined with troops and the procession was headed by a hundred elephants. He went to stay in the palace beside the Diwan-e-Khas. Mohammad Shah shifted to a palace near the Asad Burj. The Diwan-e-Khas was specially illuminated in Nadir Shah’s honor. The next day was the festival of Id-ul-zuha. The Khutba was read in the name of Nadir Shah and coins were struck. A group of Persian soldiers roaming about the city barged into shops and demanded meat and cereals for their celebration. Needless to say, they wanted to take away everything free of cost. When the shop-keepers protested it led to angry words and blows. Before long a full fledged riot broke out. Many Persian soldiers were killed by the angry mob. At last Mohammad Shah went to Nadir Shah to plead for mercy. “Not a soul has been spared by your avenging sword”, he said to Nadir Shah, “If it be your wish to carry this work of destruction further, put life back into these corpses and slaughter them again, should it please you.” At his words the killing spree came to a reluctant halt. Nadir Shah ordered his people to collect the bodies on the roads and other open spaces. Then they were all burnt in a heap, without any distinction of caste or creed. But Nadir Shah had not come to live in India or make it his home like the Mughals. After that eventful morning he concentrated on collecting an enormous booty to take back with him. He forced everyone to pay contributions – rich and poor alike – and got it by every force you can think of. His men went from house to house, digging up the floors and breaking walls in search of hidden treasures. Nearly all historians agree that what they collected in money, jewellery and other valuable objects amounted to over seventy crores of rupees. 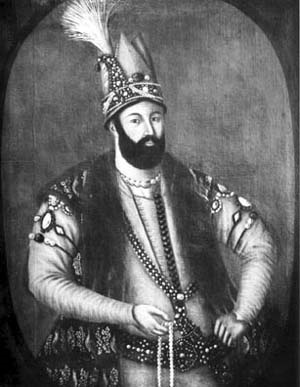 Apart from wealth Nadir Shah also took away the priceless Peacock Throne and the Koh-i-Noor. He ordered his men to pull out all the precious stones embedded in the marble palace walls and stripped the palace of all silver and gold. He took away thousands of elephants, camels and horses.. He also dragged away with him some of India’s best carpenters, stone-cutters, masons, goldsmiths and other craftsmen. In short, he carried away all that he could lay his hands upon, both living and non-living. He grabbed everything that might be of any use. You can imagine what remained after this terrible sack of Delhi from the words of the poet Mirza Mohammad Rafi Sauda (1713-1781) who was present when it happened and wrote as an eye-witness : “How can I describe the desolation of Delhi? There is no house from where the jackal’s cry cannot be heard” he wrote in his memoir, “The mosques at evening are unlit and deserted and only in one house in a hundred will you see a light burning …. Worms crawl in the places where, in former days, men welcomed the coming of spring with music and rejoicing.